President Recep Tayyip Erdoğan and Zambian President Edgar Lungu shake hands before a meeting in Lusaka, Zambia, July 28. After attending a summit of emerging country powerhouses in Johannesburg, South Africa, President Recep Tayyip Erdoğan paid an official visit to Zambia on Saturday. Accompanied by Foreign Minister Mevlüt Çavuşoğlu, Finance and Treasury Minister Berat Albayrak, National Defense Minister Hulusi Akar and Trade Minister Ruhsar Pekcan, President Erdoğan met his Zambian counterpart Edgar Lungu in the capital Lusaka.During the first-ever official visit by a Turkish president to the east African country, Turkey and Zambia signed 12 agreements, which covered agriculture, stockbreeding, fishery, tourism as well as investment, sports, and diplomacy. Erdoğan and his Zambian counterpart Edgar Lungu attended the signing ceremony after their delegation-level talks. Speaking to reporters on the sidelines, Erdoğan said the agreements were important, especially for "strengthening our relations." The president also called for organizing a joint economic commission "immediately." "I am confident that by attending tenders in Zambia, they will be successful and contribute to the upgrading of standards in these areas," he added. President Erdoğan also said he had received information from the national flag carrier Turkish Airlines (THY) Chairman İlker Aycı that the carrier could initiate flights to Zambia as of December, adding that flights would make a positive contribution to the tourism of Zambia. 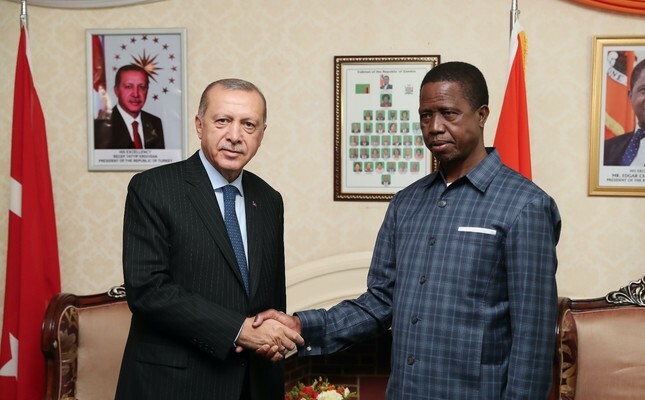 On the other hand, Zambian President Lungu praised Turkey's economic development, citing it as an example for his own country. "We want to achieve our 2030 goals with the inspiration we got from Turkey," Lungu said at an inter-delegation meeting following talks with Erdoğan. Lungu said he hopes the visit would boost bilateral ties, adding that it was important to have private sector representatives and businesspeople in the delegations. He thanked Turkey for its support in the health, tourism and media sectors. He said Zambian health minister would visit Turkey soon. Stating that he talked with President Erdoğan about power generation, he said, "We expect support from Turkish companies in power supply." Moreover, Lungu said, "We are providing conveniences to Turkish entrepreneurs, especially in construction field." He praised the public housing projects of the country. Lungu said he wishes for direct flights from the Turkish Airlines, and reminded that airports in Zambia had been renewed and modernized. the both countries, according to Zambian leader. "Turkey shows great interest in agriculture and livestock breeding projects. We have one-million-hectare land eligible for various agriculture activities, including livestock breeding and fishery, in 10 provinces," Lungu said. Prior to his visit, President Erdoğan attended the 10th BRICS summit on July 25-27. As the term chair of the Organisation of Islamic Cooperation (OIC), Turkey was invited to the 10th Leaders' Summit of BRICS countries, which was held in South Africa's financial capital of Johannesburg. President Erdoğan's participation in the summit was the first high-level official contact between BRICS and Turkey. On the sidelines of the summit, Erdoğan had said Turkey sees the BRICS summit as an opportunity to develop collaboration between the two sides, and that Turkey wants to work with BRICS countries especially in the fields of economy, trade, investment and development. The BRICS group - made up of Brazil, Russia, India, China and South Africa - was established in 2006 to enhance cooperation between member countries and also other developing countries. These five countries are G20 members, along with Turkey. The representatives of the Turkish business world were pleased with the positive approach toward Turkey in African countries, aiming to get more involved in the market in this regard. Having accompanied President Recep Tayyip Erdoğan on his African tour, Foreign Economic Relations Board (DEİK) Chairman Nail Olpak and Independent Industrialists and Businessmen's Association (MÜSİAD) Chairman Abdurrahman Kaan elaborated on the visit. Olpak noted that when financial solutions are produced, there are more opportunities to do business in these countries, adding that harmony between the leaders is an important factor in international trade. erent areas in addition to contracting, has features that a businessperson looks for in terms of banking and financial systems. MÜSİAD President Kaan also pointed to the positive approach in Africa toward Turkey. "We will come here with the intent of taking more advantage of the region. We are concerned about Africa's future, not its present," Kaan said. Stressing on the population growth on the continent, Kaan underlined that in 2050 the current population of 1.3 billion is expected to rise to over 4 billion, which is "a tremendous potential." Kaan recalled that MÜSİAD declared 2018 as the "African Year." "We operate in 74 countries worldwide. MÜSİAD has members with all kinds of infrastructure from food to building, and from textile to automotive. We are planning to increase the number of African branches from 12 to 21," Kaan said. Highlighting the parallel relation between the opportunities and the interest in Africa countries and the number of business representatives, Kaan stated that the financing solutions originating from the countries should also be moved to this region. Kaan said Africa leads the way in the target markets. "Our aim is to process the virgin territory. We have a country with a lot of accumulation, and we have to bring the business world here," he concluded.